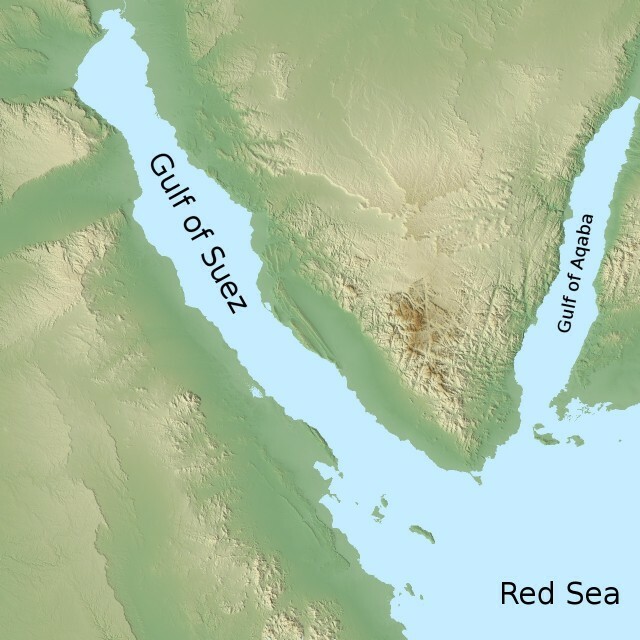 THE GULF OF AQABA is the north arm of the RED SEA; it is bordered by ISRAEL, JORDAN, EGYPT, and SAUDI ARABIA. Created by seismic activity along the Afro-Syrian Rift, it is the northernmost extension of the Red Sea. It is a semi-enclosed water body that extends south some 111 mi (180 km) from Eilat and Aqaba and joins the Red Sea at the Straits of Tiran, with its widest point spanning 17 mi (28 km). Israel’s gulf shore extends only a few kilometers, from the city of Eilat to the border with Egypt at Taba. Jordan’s shore reaches some 12 mi (20 km) in length, before meeting with the Saudi Arabia border. Egypt enjoys the longest gulf border, which stretches some 105 mi (170 km) along the SINAI PENINSULA between Taba and the Straits of Tiran. The Gulf of Aqaba supports a world class coral reef ECOSYSTEM that is noted for its intense beauty and accessibility. The gulf is exceptionally deep, as much as 5,905 ft (1,800 m) in some points, with an average depth of 2,624 ft (800 m). Because of its desert environs, very little freshwater flows into the Gulf of Aqaba and its southern mouth at the Strait of Tiran is extremely narrow. As a result of these factors, the gulf is a highly saline, still environment, with limited hydrological interface with the Red Sea. Waters that have been used for centuries for fishing, trading, and the transport of religious pilgrims are today shared with oil tankers, massive cargo ships, and growing fleets of tourists. These increased high-impact and potentially devastating uses are of concern. Increased international and regional cooperation regarding conservation, pollution, and sustainable use have been encouraging. In May 1967, during a time of attempted pan-Arab nationalism, President Abdul Nasser of Egypt closed the Gulf of Aqaba by blockading the Straits of Tiran and pledged that “under no circumstances will we allow the Israeli flag to pass through the Aqaba Gulf.” Israel’s military reaction gave proof to the Gulf of Aqaba’s strategic and political importance to the nations of the region. The Straits of Tiran played a critical role in the Arab-Israeli 1967 war, was returned to Egypt in the wake of the 1973 war, and has been monitored by a multinational peacekeeping force since 1982. Lying along the international waterway through the Suez Canal, the Gulf of Aqaba is a natural transshipment area. Improved relations among the bordering nations have encouraged the development of the Aqaba-Eilat region as a commercial gateway between Asia, Europe, and Africa. Continuing improvements of the ports and transportation infrastructure have increased the Gulf of Aqaba’s role as a regional transshipment point between the MAGHREB countries and the PERSIAN GULF. Future proposals include upgrading the Port of Aqaba, establishing inland logistic centers, improving transportation networks, building manufacturing and storage facilities, and creating international passenger and commercial airports. This complex would then be connected to other Red Sea and MEDITERRANEAN SEA ports by railroad. Such ambitious projects and proposals have been presented by the Jordanian, Israeli and Egyptian governments.